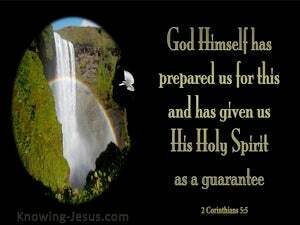 ﻿ 2 Corinthians 5:5 Now He who prepared us for this very purpose is God, who gave to us the Spirit as a pledge. And the One who prepared us for this very thing is God, who gave us the Spirit as a down payment. 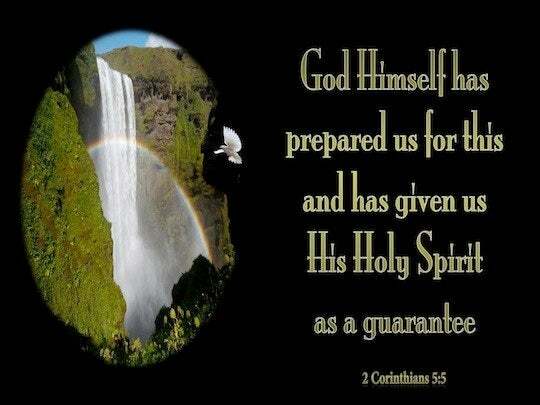 God has prepared us for this and has given us his Spirit as a guarantee. Now he who wrought us for this same thing is God, who also gave us the pledge of the Spirit. Now he that wrought us for this very thing is God, who gave unto us the earnest of the Spirit. 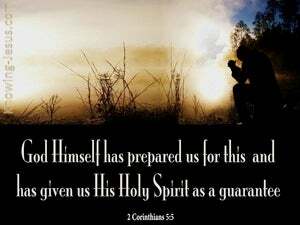 Now He Who has fashioned us [preparing and making us fit] for this very thing is God, Who also has given us the [Holy] Spirit as a guarantee [of the fulfillment of His promise]. Now God is the One who has prepared us for this very thing [i.e., the receiving of a new body to live in]. He has [also] given us the Holy Spirit as a down payment. [Note: This refers to the gift of the indwelling Holy Spirit as being a guarantee that we will receive the balance of our inheritance in the form of a new body]. Now, he that has formed us for this very thing is God, who also has given us the earnest of the Spirit. Now he who has made us for this very thing is God, who has given us the Spirit as a witness of what is to come. now he that hath prepared us for this very state, is God, who hath given us the spirit as a pledge of it. Now he that has wrought us for this very thing is God, who also has given to us the earnest of the Spirit. But the one having wrought us out unto this same thing is God, the one having given unto us the earnest of the Spirit. It is God himself who has prepared me for this change, and he has given me the Spirit as his guaranty. Now he that hath wrought us to this very thing is God, who hath also given us the earnest of the Spirit. Now he that has made us for this same thing is God, who has likewise given unto us the earnest of the Spirit. And he having brought us about to this same, God, he having also given us the pledge of the Spirit. Now he that has made us for the same thing is God, who also has given unto us the earnest of the Spirit. Now the one who has prepared us for this very [thing] [is] God, who has given us the down payment, the Spirit. And He who has worked in us for this same thing is God, who also is giving to us the earnest of the Spirit. He that hath ordained us for this thing, is God: which very same hath given unto us the earnest of the spirit. I am prepared for this change by God, who has given me the Spirit as its pledge and instalment. And He who has wrought me out for this very end is God, who has given me his Spirit as pledge. Now the one who prepared us for this very purpose is God, who gave us the Spirit as a down payment. Now he that hath prepared us for this very thing is God; who also gave to us the Spirit as the pledge. And he that has made us for this is God, who has given us the pledge of the Spirit. But he that hath wrought us for this very thing is God, who also hath given us the earnest of the spirit. 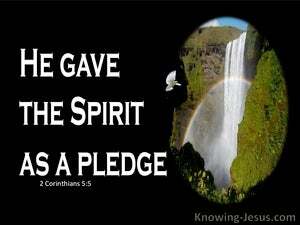 And he who has prepared us for this change is God, who has also given us his Spirit as a pledge. Now he that hath wrought us for this same thing is God, who also hath given to us the earnest of the Spirit. And He who formed us with this very end in view is God, who has given us His Spirit as a pledge and foretaste of that bliss. Now it is God Himself who has put the finishing touches on me for this change, because He has given me the Spirit as the first installment of future bliss. Now He Who wrought us for this very thing is God, Who gave to us the earnest of the Spirit. Now He, that hath wrought us hereunto, is God; who hath also given us the earnest of the Spirit.